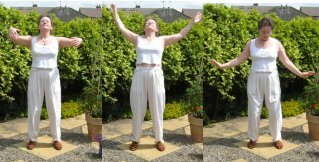 We have created a collection of pictures to go with our qigong exercise instructions. We always find that reading the instructions is easier after you have seen the pictures. These pictures were shot in continuous shooting mode - that means Rosie was actually doing the complete exercise and the camera just kept clicking. So you should be able to see the path of the moves much better than if we had just 'posed' for you. To make things faster we have just put the first section of the move on this page - that way if it look interesting you can click on the link and go to see the full page with all the instructions. reaching up and bending at the waist as the arms make a big, lazy circle. Good for the back and for training the balance mechanisms in ears. Can make some people dizzy  qigong with a buzz!